Williams Amayareacts Friday after the jury found him not guilty by reason of insanity. 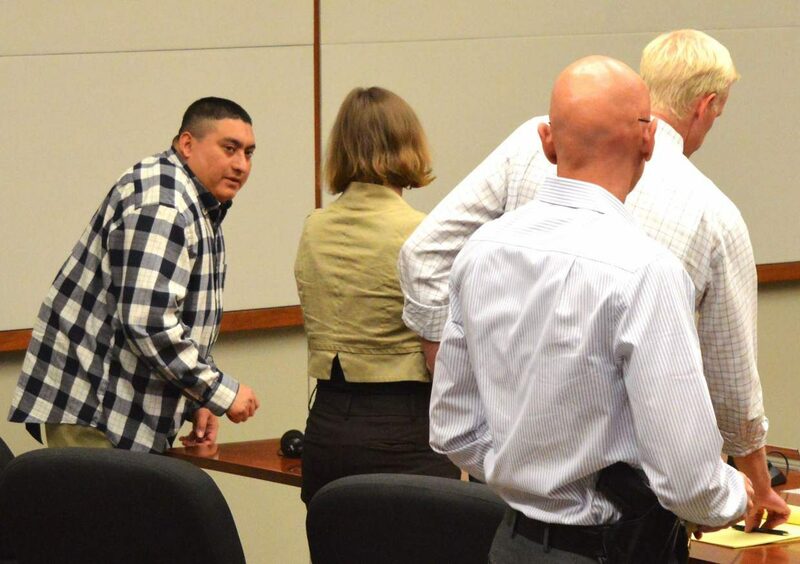 A jury found Williams Anderson Amaya not guilty Friday of all five counts he was facing connected to the slaying of his aunt and uncle in El Jebel in July 2014. They found Amaya not guilty by reason of insanity on two counts of first-degree murder for the slayings of Eliseo and Mayra Lopez; two counts of first-degree attempted murder for shooting at the beds of the Lopez’s two teen-aged boys; and one count of tampering with evidence. A juror from the Roaring Fork Valley, Joe Mitchell, said the case was extremely frustrating because the burden of proof was on the prosecution, led by Chief Deputy District Attorney Joe Kirwan. Amaya had to be found guilty beyond a reasonable doubt, which meant finding him sane. “What everybody had a hard time with was the reasonable doubt thing,” Mitchell said. The jury started deliberations at about 1 p.m. Thursday. “We were split almost 50-50 as soon as we went into the jury room,” Mitchell said. Seven people felt Amaya was guilty and five felt he was not guilty as deliberations started. Mitchell credited the jury with working through the evidence and taking their responsibility very seriously. They were determined to reach a verdict and not be a hung jury, one that couldn’t reach a conclusion. The jury went over evidence on a chalkboard. They enacted a scenario where an investigator contacted Amaya on the phone before an arrest was made. The difficult part, Mitchell said, was putting personal feelings aside and abiding the judge’s instructions to base their decision strictly on the evidence. The toughest part for Mitchell and others was reaching a verdict of not guilty given the fact that the Lopezes were killed and their boys orphaned. Thea Reiff, one of the public defenders on Amaya’s defense team, said the key witness in the case was Dr. John Hearn, a forensic psychiatrist who is among the mental health experts contracted by the state government to undertake evaluations at the state mental hospital in Pueblo. He wasn’t paid by the prosecution or the defense. “At the end of the day, there was only one expert opinion from the court’s doctor on the issue of sanity and that was that he was legally insane,” Reiff said. The jury had an extremely tough decision, she said, but they rightfully applied the required standards. “The only issue for the jury was whether the prosecution had proven sanity beyond a reasonable doubt,” she said. Hearn diagnosed Amaya with having schizophrenia after interviewing him Nov. 6, 2015. “He was legally insane at the time of the crimes,” Hearn said while testifying earlier this week. Reiff said it was a truly an “awful case for the victims and their family and the community.” She also said it was one of the most definitive cases where she’s represented a defendant who truly met the standard of insane, rather than being mentally ill.
Mitchell said some jurors were frustrated that they couldn’t find Amaya guilty under the parameters of the law. He said he thought Kirwan did a good job presenting the case against Amaya. “It’s just kind of hard to say he was sane at the time,” Mitchell said. The case cannot be appealed by the Fifth Judicial District Attorney’s Office because that would constitute double jeopardy, according to Kirwan.